Calling all history lovers, you’re going to love this video slot game by NextGen Gaming. Revisiting the legendary past of the 300 Spartans with an action-heavy ancient Greek theme, it’s time join one of the greatest battles of all time. The aim of the game is to defeat the Persians, so you’re going to need all your courage to reap the benefits. That’s right – a victory in 300 Shields comes with attractive rewards. However, this isn’t your typical 5x3 online slot game, it’s a fast-moving battle with well-designed icons resembling gladiators, weapons and more. Not to mention the game also has an impressive gaming ingredient, known as the battle feature. This comes into play when 3 or more SCATTER Shield symbols appear, making it a game-play worth every penny. NextGen Gaming has been around since 1999, and it’s easy to see why with their ever-growing range of fantastic slots. Their games can be found in over 100 online casinos, so there’s plenty of chance to check out their incredible creations. With a long list of games to be proud of, it’s hard to narrow them down. Meanwhile, some have proved more popular than others, and these tend to be their big titles like Foxin’ Wins, Judge Dredd and Psycho. This is because they offer an interesting blend of features combined with excellent graphics. 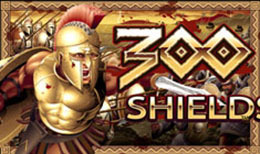 Taking inspiration from the much-loved film 300, this standard 5 reel, 25 payline slot game is entertaining to say the least. You can start the game of with a measly 25p and there’s a maximum betting level of £50 per spin, so you may want to base this on your experience with slots online. Spartan imagery is used throughout as well with symbols like swords and arrows to play with. This is also evident through the game’s more valued features such as the SCATTER, which is represented by a shield and the WILD which is represent by a warrior. This makes the game all the more appealing for history-loving players. Though, the most exciting aspect of the game comes from its name. Yes, the epic battle feature offers the chance to get a 300x multiplier, so there’s a possibility this game can produce large winnings. The feature comes in stages, so in order to win big you’ll have to make it to the last stage – the fourth and final stage one. This happens when 3 or more SCATTERS land on the reels, triggering five Free Spins. From here, you can receive greater SCATTER Shields, which can lead to more Free Spins and bigger multipliers. Online slots don’t get much more exciting than 300 Shields. With attractive visuals and an impressive bonus feature, the hardest thing about this game is convincing yourself to stop playing. With a good share of Free Spins and multipliers, there’s plenty of chance to up your stake. And even better, you can win big with multipliers of up to x300 – thought that might grab your attention.